Stacie was one of Smile-A-Mile’s first campers and we love to see her arrive to Teen Weeklong camp every year! Some of her favorite things to do at camp consist of floating around in the pool, boat riding and making crafts for momma. You can also find her dancing and singing to Michael Jackson every chance she gets, especially at the talent show! 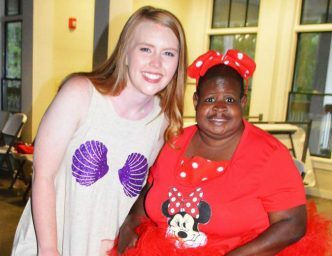 Each year you can guarantee that Stacie will show up to the dance in another awesome costume like this Minnie Mouse one that her momma made. Smile-A-Mile is one of her favorite places to be and we cannot wait for another summer with her at Teen camp!